I have been noticing the 100dayproject hashtag on Instagram and I have discovered that there is a history to this approach to creativity, but one group effort to rally folks around it recently began last week--so I am not too late. These structured challenges seem to help me move ahead. 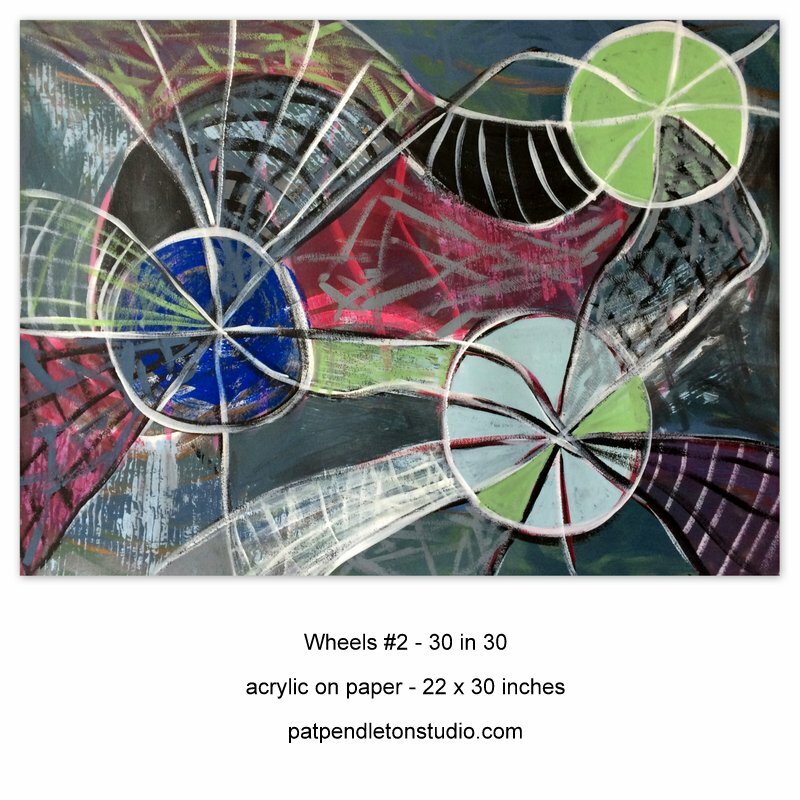 While I am working on a series of paintings on the wheel image that has come up for me repeatedly, I will post these paintings on my gallery page when completed. I also have a writing project of short memoir pieces that could use more attention. Still, I want to define this 100 day project as something else, something simple and straightforward--something do-able. For several years I kept notebooks with notes and quotes from books I was reading. I am not doing this so much lately, but these notebooks contain a treasure of wonderful quotes to ponder. I will create small digital collages to feature these words as a way to share some of this material with others. I began February with a plan to post a painting a day for a thirty paintings in thirty day challenge that happens each Fall and Winter through some artists on a podcast that I listen to (Artists Helping Artists). 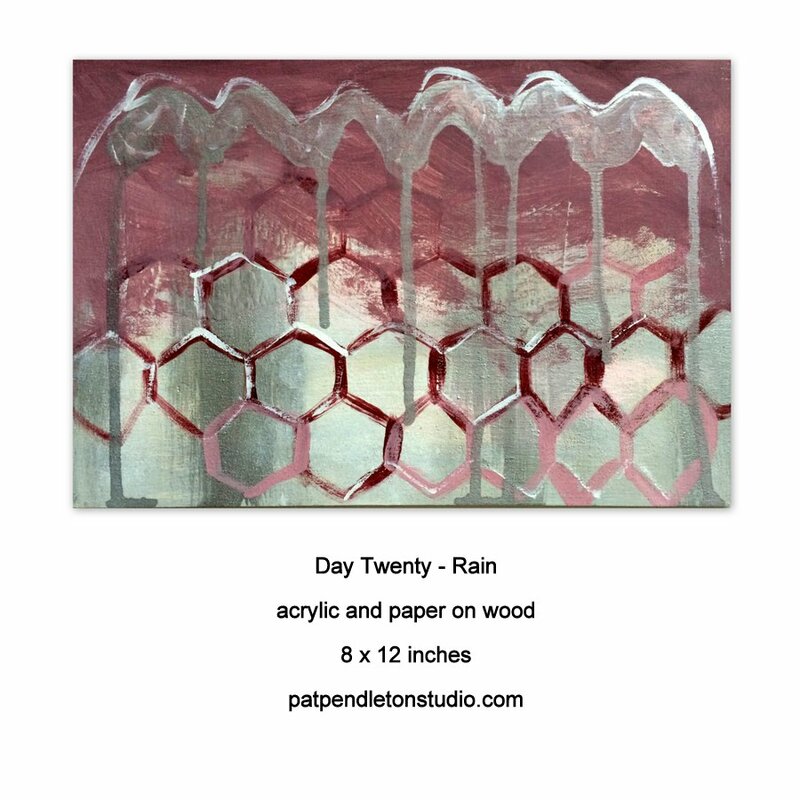 I posted 23 new paintings and the last one was a triptych so I think of my output as 25. Although I have new work in progress, it is the last day of February. The challenge goes a couple more days into March to account for the short month of February. I am pleased with my 25 and I have sort of moved on. Found myself side-tracked on posting of few of these new pieces on a site that offers archival prints. Several of my images may now be ordered as prints at Imagekind starting at $26 for a small unframed print. Larger sizes, along with mat and frame options are available. There is also an option for wrapped canvas prints. "Painting, I think it's like jazz." "It's very beautiful over there." about over there...and still, I am simply here. I tend to be curious about what is behind the main event. What happened leading up to this? How does a person become the way they are? Why do we choose one thing over another? In art and dream may you proceed with abandon. In life may you proceed with balance and stealth. in the world now...wheels turning. About 20 years ago I was driving out west and entered a tumbleweed storm--a multitude of the weedy nests blew about the two-lane road and one even dared to startle me by bouncing off my windshield. Sometimes blowing about aimlessly is not such a bad thing. The process of making this painting was a bit like that. Sometimes no explanation is required. "To escape criticism--do nothing, say nothing, be nothing." Three is the first true number. Dreaming of France is the title of a new book by my friend, Kerry Tepperman Campbell. I just ordered a copy from Amazon. Published by Blue Light Press, the writing is described as "sensual & imaginative transcendence" and "impossible to categorize," both inspired notions to assign to any work of art. My pink tower is a tribute to these ideas.